YOUNG BLACKS IN ACTION, INC.
"STRIVING TO DEVELOP STRONG WORK ETHIC, LEADERSHIP, AND COMMUNITY SERVICE"
YBA has over the years garnered several awards that include first place for the Orlando MLK parade for the last three consecutive years. As, well as, that same honor for the MLK parade of Eatonville over the last several years. Last Year, YBA won 1st place in August 2010 at the 117th National Annual Shriner’s Imperial Council Parade in Ybor City, Florida. Also, due to the experiences as a YBA member, many participants have gone on to participate in their respective Middle School, High School and College/University Bands, Dance teams and other school-related activities. Additional cultural arts programming was started January 2014. 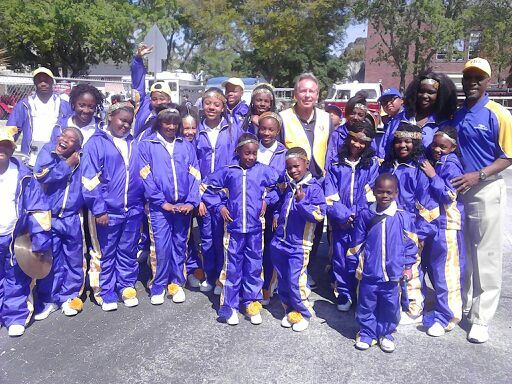 In order to provide a broader range of activities for YBA’s targeted population – there will be an addition of dance classes, that include tap, ballet, jazz, and hip-hop, along with expansion of the band into woodwind, brass and strings to formulate a YBA Community Orchestra and Dance Troupe. Also, other program expansion will include cultivating the targeted population artistic abilities in the arts of drawing, painting, ceramics along with theater development that will include poetry, play productions, and stage crew development.. The main events for YBA will continue to consist of marching in parades and stage performaces. YBA is based in Orlando, Florida.